Quiet location, two bedroom semi-detached bungalow in delightful community village. EPC rating C. DESCRIPTION Situated in a level location with good access to the wide-ranging amenities that this popular village offers is this two bedroom semi detached bungalow with gardens, garage and parking. The property has been rented out for the past few years and although has been part modernised by the current vendors it would benefit from further updating and there is still plenty of opportunity to make your own mark and create a warm and friendly home. The property is set back from the road and is approached over a pathway which crosses a small green with a beautiful mature tree. 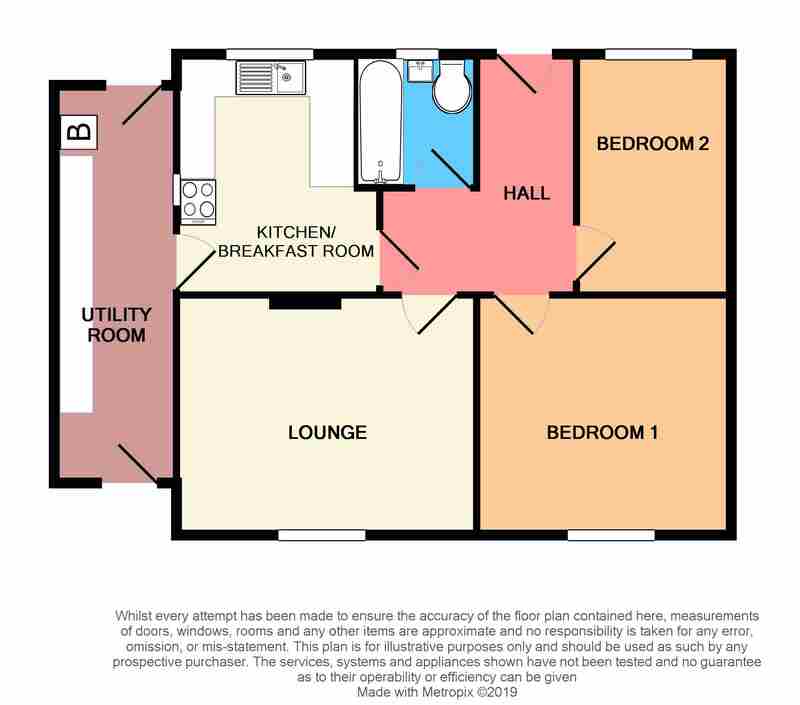 The bungalow comprises; lounge, kitchen, utility, bathroom and two bedrooms. Outside there are front and rear gardens, both well enclosed and a garage (situated in a block literally a few steps away). The property is warmed by double glazed with gas central heating. EPC rating C.
DIRECTIONS From the centre of the village and Wrington Motors proceed along School Road and turn right into South Meadows, then turn left at the T-junction and follow the road round into South Meadows and the property can be found on your right in the bottom cul de sac with a Debbie Fortune For Sale board. SITUATION Situated with good access to local amenities and surrounded by beautiful countryside, Wrington (www.wringtonsomerset.org.uk) is the jewel in the crown of the Wrington Vale and one of the most sought after villages in North Somerset. Picturesque with a lengthy and interesting history, it benefits from facilities usually reserved for a larger town, including two pubs (one with an excellent restaurant), church and a chapel, a primary school (awarded 'Outstanding' by Ofsted), post office, public transport, petrol station, pharmacy, dentist, coffee shop, grocery shop, off licence/convenience shop and even two florist/gift shops (one in the village centre and one on the outskirts). Secondary schooling is available at nearby Churchill Academy and Sixth Form Centre (www.churchill.n-somerset.sch.uk), also recently awarded 'Outstanding' by Ofsted (with transport for local children provided daily), and which also benefits from a modern sports complex open to the general public. Further schools, both state and private, are at Bristol, Backwell, Wraxall and the Chew Valley. The area around is well known for its beauty and offers a variety of community pursuits. Indeed, riding, walking, fishing, sailing and dry skiing are just some of the activities available within a few miles. The village itself is within commuting distance of Bristol and the seaside town of Weston-super-Mare and there is access to the motorway network at Clevedon (junction 20) and St. Georges (junction 21). There is an international airport at Lulsgate and a mainline railway station at Yatton. OUR VENDOR SAYS The bungalow is very and cosy and all the neighbours are lovely and welcoming. It is also very cheap to maintain and run in the long term. WE HAVE NOTICED Located just a few minutes' walk from the range of shops, pubs and further amenities that the village offers this property would be perfect for someone looking to downsize, wanting practicality and convenience, especially as the position is so central. However, the property has also been rented out very successfully in the past so there may also be scope for investors, or first time buyers in our option. RECEPTION HALL Radiator, coved ceiling, access to loft space. LOUNGE 13' 8" x 10' 11" (4.17m x 3.33m) Coved ceiling, radiator. UTILITY ROOM 18' 1" x 5' 7" (5.51m x 1.7m) Doors to both the front and rear, base and wall units, Vaillant gas fired combi boiler, radiator. BEDROOM ONE 11' 7" x 10' 9" (3.53m x 3.28m) Radiator. BEDROOM TWO/DINING ROOM 10' 11" x 7' 0" (3.33m x 2.13m) Radiator. BATHROOM 6' 1" x 5' 4" (1.85m x 1.63m) Suite of panelled bath, pedestal wash hand basin, low level wc, tiled walls, radiator, coved ceiling. GARDEN Front garden is level laid to lawn with flower borders and with picket fencing. Rear garden is bordered by panel fencing, and includes a patio area perfectly sited to enjoy the evening sun.